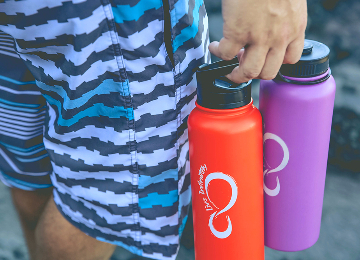 Choose Your Options Below - With 3 different sizes of 30oz, 40oz or 64 oz and over 10 vibrant color choices we have the bottle to fit just your taste! Double walled vacuum insulated 18/8 Food Grade Stainless Steel keeps your ice frozen 30+ hours and your coffee at the perfect temp for 12 hours like pure magic! The isolation of the inner chamber from the outside temperature sources assures no sweating, puddles or luke warm water. 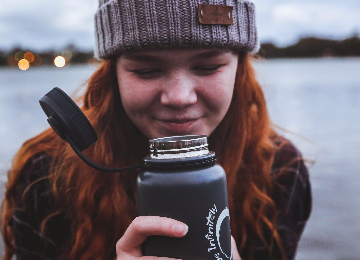 The industry’s first and only insulated infusion water bottle includes 1 flip top lid with handle, 1 wide-mouth insulated lid, 1 carabiner, 1 full length Tritan fruit infusion rod. We used only top quality food safe 18/8 stainless steel that is BPA free and rust resistant. The wide mouth opening and smooth interior surface makes even cleaning your bottle a breeze. FREE RECIPES INCLUDED – Not sure where to start? Enjoy our free infused water recipe eBook as OUR GIFT TO YOU including over 20 of the best combinations! 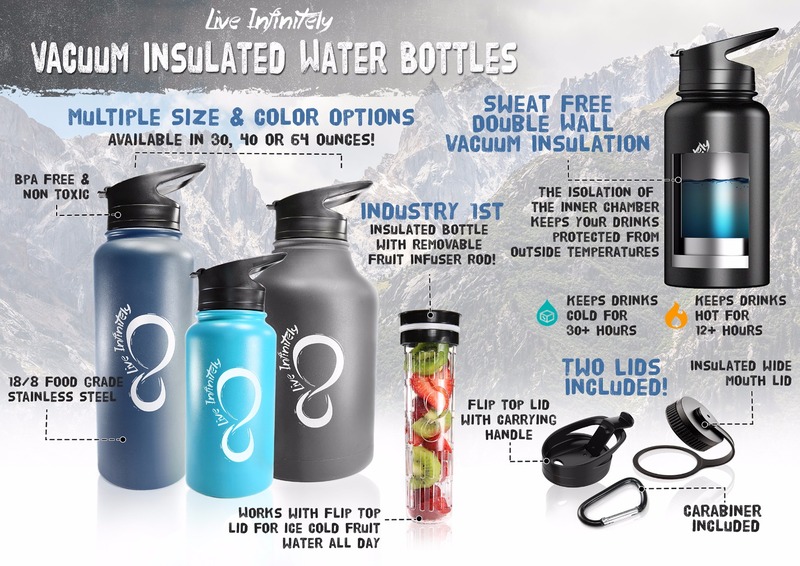 Every bottle is Live Infinitely backed with a 1 Year Unlimited Warranty. Double walled vacuum insulated 18/8 Food Grade Stainless Steel keeps your ice frozen 30+ hours and your coffee at the perfect temp for 12 hours like pure magic! The isolation of the inner chamber from the outside temperature sources assures no sweating, puddles or luke warm water. 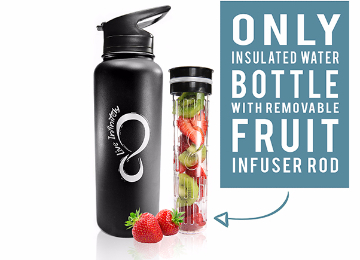 With a removable fruit infuser and vacuum insulation, you've just found yourself the ultimate versatile bottle! 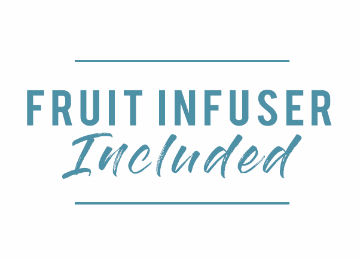 Crush your water intake goals with water that is not only cold but also crazy delicious with fruit infused water and spiked with vitamins and minerals. All our bottles are FDA approved as we only use top quality food safe 18/8 stainless steel that is BPA free and rust resistant. The wide mouth opening and smooth interior surface makes cleaning your bottle a breeze. Making it the perfect for anyone, even the kiddos! 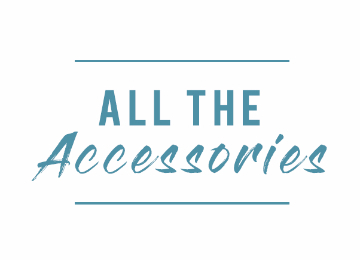 Get everything you need for a multifunctional bottle all in one swoop! 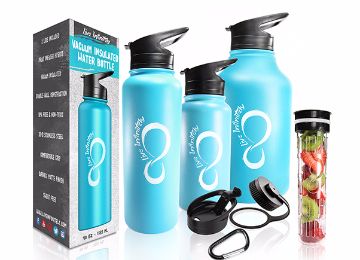 Every bottle includes a flip top lid, wide mouth insulated lid, carabiner and removable fruit infuser rod. Use the time you saved shopping around for extra lids to enjoy a day out with your family!  Our Awesome 1 Year Warranty! My experience with this item has been fantastic, comfort is not common in the military so having one of these bottles to keep my beverages cold for hours is a lifesaver .Whether I'm in a stuffy vehicle hangar or the middle of the desert I can count on my live infinitely bottle to do its job thumbs way way up!!!! When I say it's the coolest bottle, I mean it literally!  Even when I left the bottle in my hot car on a hot August day, the water stayed cool. I am so impressed and take it on every trip I go. 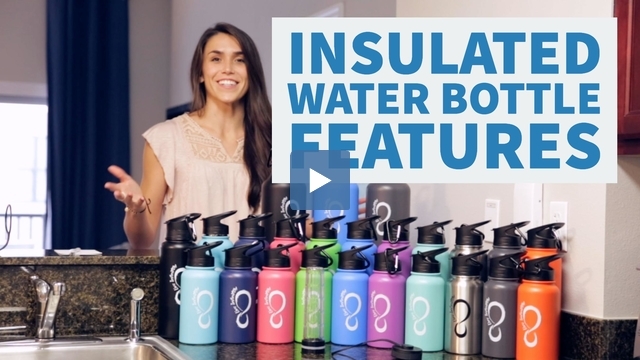 I'm super excited to use my insulated bottle with warm beverages in the winter! Thank you Live Infinitely!